Every state in the U.S. but Vermont has reduced its avoidable hospital readmission rates since 2010, new data released Tuesday by the CMS show. These improvements follow the implementation of various CMS programs and initiatives to improve the quality of care, chief among them the Hospital Readmissions Reduction Program. The overall decrease in readmission rates translated to about 100,000 hospital readmissions avoided for Medicare beneficiaries in 2015 alone, and some 565,000 readmissions since 2010. “The Hospital Readmissions Reduction Program is just one part of the Administration's broader strategy to reform the health care system by paying providers for what works, unlocking health care data, and finding new ways to coordinate and integrate care to improve quality,” wrote Dr. Patrick Conway, principal deputy administrator and chief medical officer for the CMS, and Tim Gronniger, the deputy chief of staff for tjhe CMS, in a blog post Tuesday announcing the new data. “The data show that these efforts are working,” they added. The one state where Medicare's 30-day hospital readmission rate rose was Vermont, from 15.3% in 2010 to 15.4% in 2015. 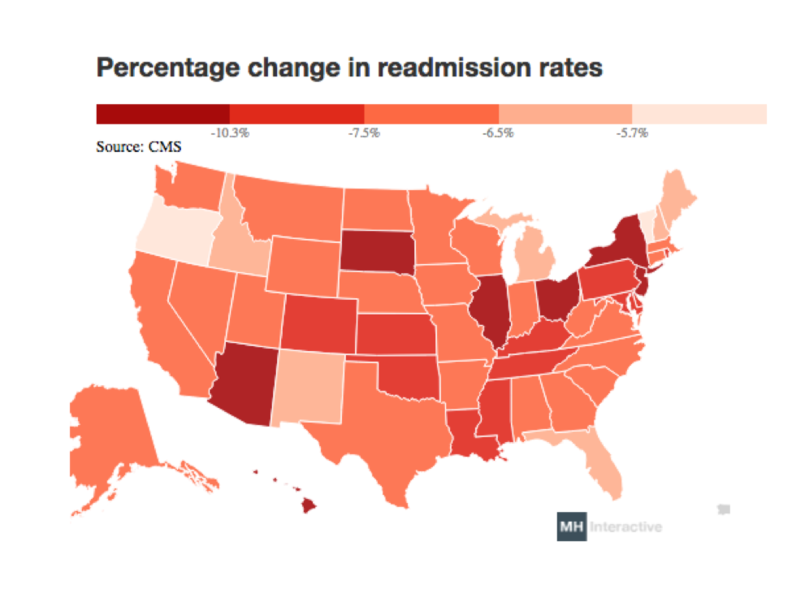 The CMS described this as “virtually unchanged.” Of the states where readmissions fell, 43 saw decreases of more than 5%, while in 11 states rates fell by more than 10%. Readmission rates also dropped in Washington, D.C. The Hospital Readmissions Reduction Program was created under the Affordable Care Act. It took effect Oct. 1, 2012, cutting Medicare payments to hospitals with excess readmissions for a handful of conditions. For the coming fiscal year, those cuts are capped at 3%. The program is rooted in the idea that unnecessary readmissions are a sign of poor quality care, and that by devising the proper financial incentives, the CMS can encourage hospitals to prevent excessive returns through better follow-up care after patients are discharged. The number of applicable conditions in the program has grown steadily since 2012, with coronary artery bypass graft surgery as the most recent addition. Starting in October with the new federal fiscal year, hospitals will be held accountable for readmissions for that condition and five others: heart attacks, heart failure, pneumonia, chronic lung disease, and hip and lung replacements. The CMS estimates that it will penalize more than 2,500 hospitals—more than half those in the country— for excess readmissions in the coming fiscal year. Those penalties will save the agency about $538 million, up $108 million from the year before. It expects to spend about $746 million on inpatient hospital services in the coming fiscal year.